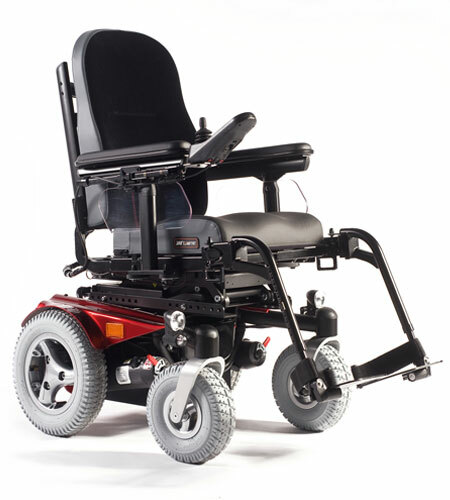 This powerchair has excellent performance with outstanding adaptability. A low-maintenance powerchair that can be used as part of your everyday lifestyle. Price excluding VAT.(Incl. VAT £7,224) *VAT Relief available on this product. The QUICKIE JIVE-R² powered wheelchair provides excellent performance both indoors and outside. A durable base gives great stability and control while remaining highly manoeuvrable. When using this powerchair outside, the SpiderTrac gas suspension will smooth out any bumps from the rough or uneven terrain. It also helps to keep the seat stable which really adds to the overall drive experience. The Jive R2 is capable of climbing and descending kerbs of up to 4 inches with no sudden jolts or forward tilting. The seating system is beautifully designed and can be customised to your personal requirements. You can make changes to the width, depth, length, and angle on the backrest. The Jive-R2 also has a low seat to floor height (starting from 43cm) to make transferring in-and-out of the chair easier. For the technologically minded, the control system can be expanded with R-Net. This system enables you to have conversations on the move or control your smartphone via the built-in Bluetooth. For your peace of mind, the Jive R2 has been transit tested and is approved for transportation in a vehicle. The Jive R2 is a top performing low-maintenance powerchair that can be used as part of your everyday lifestyle. It’s also the most affordable in the Sunrise Medical Jive Range of powerchairs. If you’re interested in the Quickie Jive-R2 or any of our powerchair range, then why not call us on 02392 255600 to arrange a demonstration. Alternatively, pop into one of our showrooms for more information.